Halo 4 will be the first game in the main series to have not been developed by Bungie. If you think that means the new studio at the helm would want to tinker with the design of the game's hero, you are dead right. 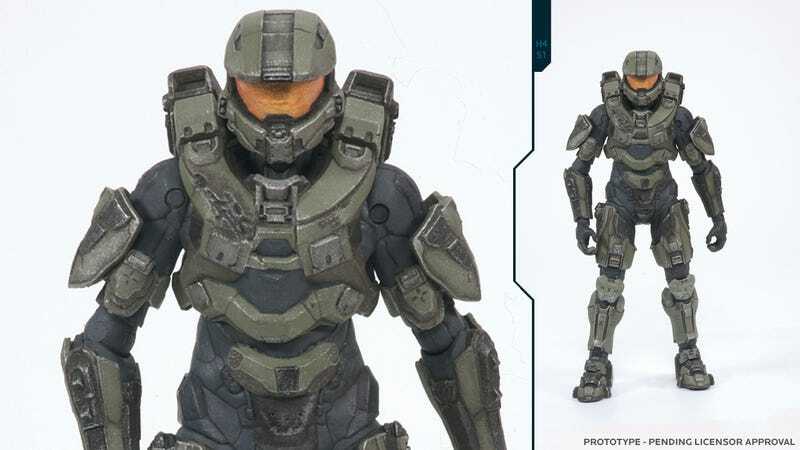 McFarlane toys have released the first images of their Halo 4 action figures, and whaddya know, Master Chief - despite having been locked in a cryo chamber between Halo 3 and 4 - has somehow found the time to have a new suit made up, one that goes all Old Snake around the guts and all 80s shoulder-pads around the top. In addition to the Halo 4 shot, McFarlane also released images of new lines of Halo toys based on Xbox 360 avatars, as well as some new takes on older games in the series, including a pretty fetching ODST Drop Pod. UPDATE - As some eagle-eyed readers have pointed out, this may not be an entirely new suit! Chief may have actually ripped parts off his old suit. Or they fell off in his sleep. Or he pawned them for bullets. Something!